Where can I buy Spinergy wheelchair wheels? Most major wheelchair manufacturers have Spinergy wheels as an option on their order forms. If you're ordering a new wheelchair, ask your dealer or prescriber if Spinergy wheels are an option for you. If you want to order Spinergy wheels for a wheelchair you already have, speak with your local wheelchair dealer to see if they can order wheels for you. Or, you can search on the internet for several on-line dealers (most will ship world-wide). Feel free to call us if you need assistance. Why does Spinergy make two styles of hubs for the everyday wheels? The difference between them is the bearing spacing (distance from outside of one bearing to the outside of the other bearing). Each wheelchair is different. Some wheelchair manufacturers require different clearance between the chair and the wheels. We have a "standard" hub with 1.8" bearing spacing, and an "X2" hub with 2.3" bearing spacing. The standard hub will result in the wheels positioning closer to the chair (too close for some wheelchair designs and the spokes interfere with a part of the chair). The X2 hub will result in the wheel positioning a little further away from the chair allowing for additional clearance. Which one works for you depends on the wheelchair you use. Yes, in most cases. Our Spinergy "SPOX Everyday" and "Light Extreme" hubs are some of the narrowest hubs available. The overall hub width is 79mm (3.1") and the bearings are recessed inside the hub (vs. being flush with the outside of the hub), so the wheel actually positions itself closer to the side of your chair. Does Spinergy sell tires and axles? Yes! We carry a select line of quality tires and tubes. We carry tires for everyday wheelchair use, and tires for sport use. The axles we offer are premium quality. We offer steel and titanium options. Our patented use of fiber spokes has numerous benefits to the user. Fiber spokes act as a vibration and shock dampener - 25% more absorbent than steel. Our spokes are much lighter than steel spokes - 1/2 the weight. Fiber is much stronger than steel - 3x as strong. Combined with our custom rim and hub, it's the highest performing and most reliable wheel design on the market. My tires don't fit, do I have the wrong size? Still having problems? Visit your local wheelchair dealer or bicycle shop and have them install the tires for you. What axle length do I need for my Spinergy wheels? Your axle length depends on two things: 1. Length of axle receiver in wheelchair camber tube. 2. Distance between outside of bearing to outside of bearing in your hub. Measure these two lengths and this will give you the axle length you need. What kind of air valve is this in my tire, and why doesn't my air pump work? There are two types of valves. Your Spinergy wheels could have either one. Schrader (like a car tire valve) - if you have this valve, most pumps will work. 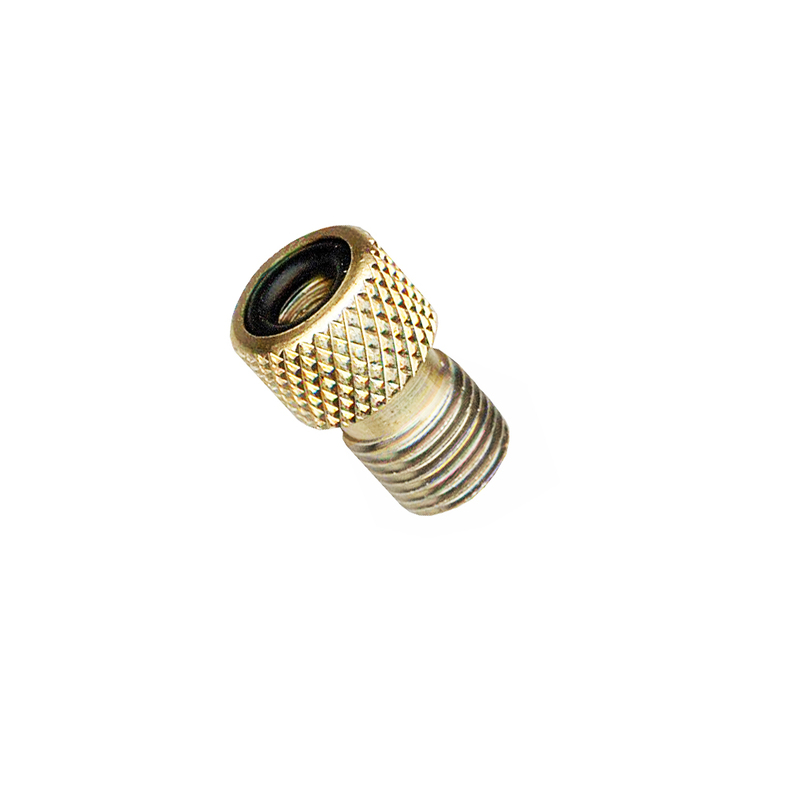 Presta or “French valve” (skinny valve with threaded valve-release) - if you have this valve, the gas station style pump will not work unless you have an adapter (Adapter: http://www.koolstop.com/images/Accessories/KS-PO.jpg). Most hand pumps and compressor pumps have reversible heads to accommodate either valve. It's not a bad idea to buy an adapter and just leave it on your wheels so it's always there. Where can I buy replacement spokes? Any wheelchair dealer or bike shop can special order spokes for you. Or, there are several dealers on the web if you do a google search for “Spinergy spokes”. You will need to know your wheel size, wheel type and spoke color.